The Inter-Site Topology Generator (ISTG), which is responsible for managing the inbound replication connection objects for all bridgehead servers in the site in which it is located. There is only 1 Inter-Site Topology Generator per site and the first server in the site becomes the ISTG for the site. Connection objects for bridgehead servers for inter-site replication are created differently. 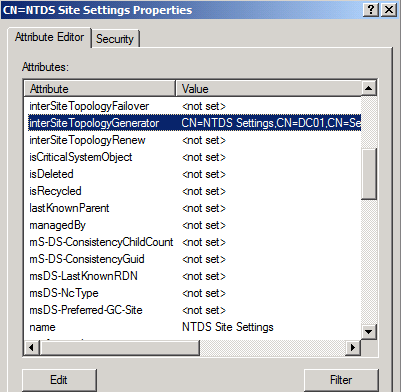 The KCC on one domain controller (regardless of the domain) in each site is responsible for reviewing the inter-site topology and creating inbound replication connection objects as necessary for bridgehead servers in the site in which it resides. 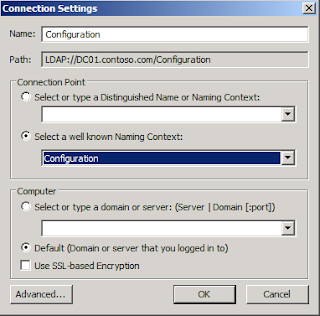 This domain controller is known as the Inter-Site Topology Generator (ISTG). The domain controller holding this role may not necessarily also be a bridgehead server. 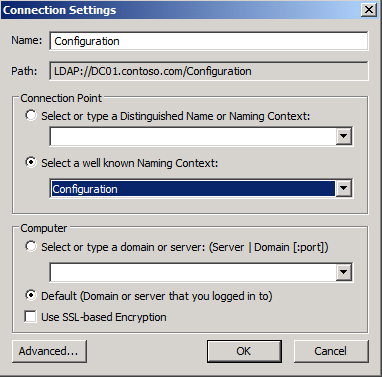 When the ISTG determines that a connection object needs to be modified on a given bridgehead server in the site, the ISTG makes the change to its local Active Directory copy. As part of the normal intra-site replication process, these changes propagate to the bridgehead servers in the site. When the KCC on the bridgehead server reviews the topology after receiving these changes, it translates the connection objects into replication links that Active Directory uses to replicate data from remote bridgehead servers. 6. 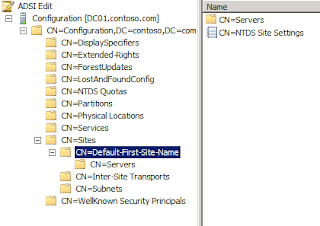 Expand "Configuration > CN=Configuration,DC=<Domain>,DC=com > CN=Sites > CN=<Site Name>. 10. You can modify the "CN=<Server Name>", click "OK" twice. Remark: This option is per site setting.